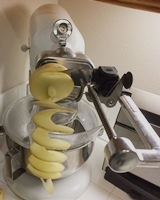 Our KitchenAid spiralizer attachment does more than just spiralize. In fact the official name is the KitchenAid Spiralizer Attachment with Peel, Core and Slice. We have discovered how well the slice blade works. I used it on Yukon Gold potatoes for a potatoes gratin recipe. The slices come out in one long ribbon, but it is easy enough to cut them into individual slices. The nice thing is that all of the slices are highly consistent. 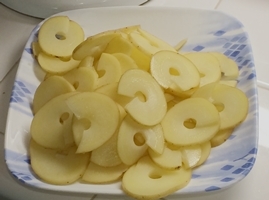 When you slice something like a potato by hand, it is hard to make all the slices consistent. Even using a mandolin slices will not be completely consistent as it’s hard to keep one’s pressure consistent on the blade. Because the slices were all so consistent my potatoes gratin came out evenly cooked and very tasty. Another reason to appreciate our new KitchenAid attachment.